RIPASA Treatment Without Operation (TWO) – A Non-Inferiority Prospective Randomised Clinical Controlled Trial of Antibiotic Non-Operative Management Strategy versus Surgery Management Strategy for Early Uncomplicated Acute Appendicitis. Chee Fui CHONG, Shahriman HUSAIN, Linawati JUMAT, Kim Khee TAN, Samuel KS YAP, Mohammad Ady Adillah AHMAD, Chean Leung CHONG, Amy THIEN, Lian Tat TAN for the RIPASA-TWO trial group. Prempreet Kaur Manjit SINGH, TEOH Jian Woei, Zakinah YAHAYA, FONG Voon Hoong, Mohd Razif MOHAMAD YUNUS. Wardati Sahimin YAKOB and Mohin MOMIN. Systemic Calciphylaxis: Diffuse Cutaneous Involvement and Ischemic Optic Neuropathy – a case report. Nurshazwani MAT SALLEH, Yin Ping LIEW. Prenatal Ultrasound Diagnosis Of Cephalothoracomphalopagus Janiceps Monosymmetros. SANDHYA SUDHIR KAMBLE, FAIZAL BIN SHARIF, INDULEKHA ANAYATH. A Rare Case Of An Isolated Central Retinal Artery Occlusion Following A Recreational Scuba Diving: A Case Report. Tuan Hairulnizam Tuan Kamauzaman, Ahmad Razif Omar, Nik Hisamuddin Nik Ab Rahman. Imaging Guided Thoracic Epidural Catheter Insertion In A Morbidly Obese Patient Undergoing Elective Thoracotomy. Nadia H. ISHAK, Norliana D. MOHAMAD ALI, Rusnaini MUSTAPHA K, N. Izham ISMAIL, Adli A. MOHAMMAD RAZI, M. Zamrin DIMON, Karis MISIRAN. Letter to Editor in response to the article by Wong et. 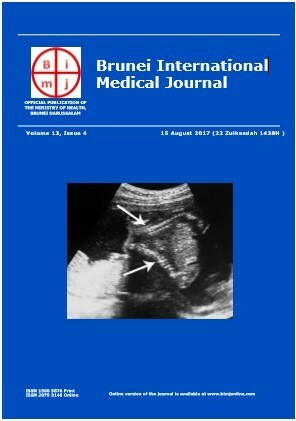 al., on “Colonic diverticular disease in Brunei Darussalam” published in Brunei Int Med J 2017;12(6):191-5. Vui Heng CHONG, E Ru WONG, Fazean IDRIS.